At 05:00 hr PDT the center of Hurricane Norbert was about 205 km - 125 mi W of Cabo San Lucas Mexico, about 205 km - 130 mi SSE of Cabo San Lazaro Mexico. 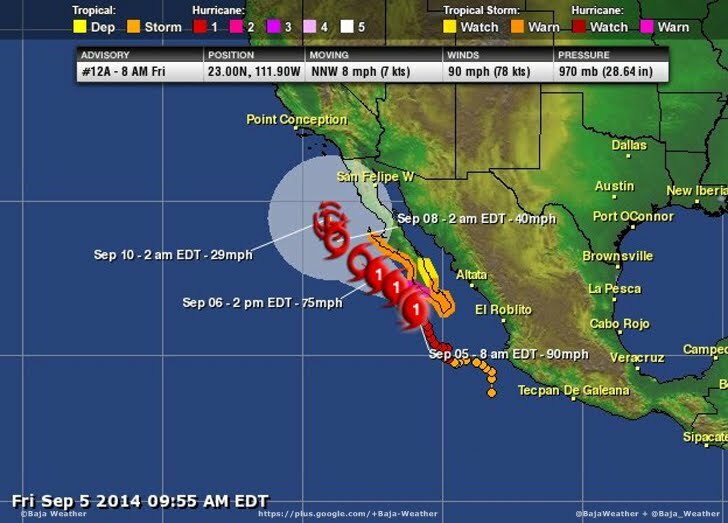 Norbert is moving toward the north-northwest near 13 km/h - 8 mph. A turn toward the northwest is expected later today and this general motion should continue through Saturday. On the forecast track the center of the hurricane will continue to move nearly parallel to and just offshore of the Pacific coast of the southern Baja California peninsula through Saturday. A Hurricane Warning means that hurricane conditions are expected somewhere within the warning area...in this case within the next 24 hours. Preparations to protect life and property should be rushed to completion. A tropical storm watch means that tropical storm conditions are possible within the watch area.